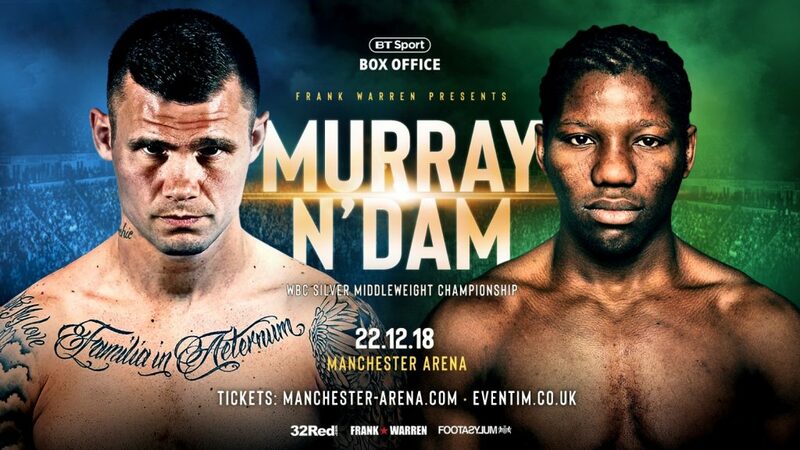 Martin Murray will face former world champion Hassan N’Dam as part of a massive night of boxing at the Manchester Arena on December 22, headlined by Josh Warrington defending his IBF world featherweight title against two-weight world champion Carl Frampton. Murray, 37-4-1, is building towards another world title challenge, with his only career reverses having come in three previous bids – with one drawn – and against former WBA world champion George Groves. The St Helens warrior put himself firmly in position for a tilt at the WBC title with the winning of the governing body’s Silver middleweight belt in June by defeating the champion Roberto Garcia via a unanimous decision over 12 rounds at the 02 Arena. He is now up against a dangerous opponent in N’Dam, 36-3, who has operated at world level since winning the WBA Interim world title with a points victory over Avtandil Khurtsidze in 2010. His winning streak continued with wins over Giovanni Lorenzo and Max Bursak – before he lost on points to Peter Quillin in 2012 with the WBO world middleweight title at stake. The Frenchman rebuilt with four victories across 2013-14, with the fourth being a landslide points win over Curtis Stevens that qualified him for a shot at the IBF world title. A thrilling encounter with David Lemieux followed with the Canadian prevailing via the scorecards, with N’Dam showing huge bravery after being put to the canvas on four occasions by the heavy-hitting Lemieux. A further four wins followed for the now 34-year-old before he headed to Japan in May 2017 to face London 2012 Olympic gold medallist Ryōta Murata for the vacant WBA regular world title, which he won via a controversial split decision. The pair rematched five months later, again on Japanese soil, where N’Dam was forced into retirement in the seventh round. “He is obviously a good opponent and I have known about him for a while,” reacted Murray to the news of a tough night’s work being booked for him at the Manchester Arena. “He is a former world champion and a good fighter. “It’s a good fight for me, one where I need to be on top of my game because he can box, he can move and he can fight as well. I am happy with it. “I don’t want to be fighting in six or eight rounders against opponents who I am going to get out in two or three rounds. I need proper live opponents and this guy is one – and he will be coming to win. “It is just the sort of fight I need.